A carefully calibrated legislative strategy in Springfield led to Illinois becoming, in 1913, the first state east of the Mississippi to grant women the right to vote. On June 10, 1919, the state then became the first in the nation to ratify the 19th Amendment to the U.S. Constitution. Illinois’ suffrage initiatives were mostly orchestrated by the Chicago-based Illinois Equal Suffrage Association, but central Illinoisans, both men and women, played significant roles in the process as well. The 1913 law wasn’t the first time Illinois women had been able to cast ballots; they won the right to vote in school elections since 1891, and they soon began winning seats on school boards. In the Springfield area, Mrs. E.A. Malouen (local news reports continued to identify married women by their husband’s names for years) was elected president of the Riverton School Board in 1894. In the momentous 1911 local elections — in which city voters adopted commission government, Willis Spaulding won the first of his eight terms as utilities comissioner, and Capital Township was made coterminous with the city (all with only male votes) — two women were elected to the Springfield School Board for the first time. Ida Hanes and Mary Morrison, the only two women on the 18-person ballot, “were both elected by substantial majorities,” the Illinois State Register reported on April 5, 1911. 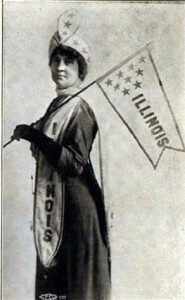 Some Illinois women had been advocating for the right to vote since the 1860s, but the effort escalated in the 1910s, when Grace Wilbur Trout became president of the Equal Suffrage Association. The first need was for basic organization, Trout said in a detailed report on the final successful push, published in the Transactions of the Illinois State Historical Society for the Year 1920. Immediately after my election to the presidency we realized the necessity of strengthening the organization work, for … there were many Senatorial districts in which there was no suffrage organization of any kind, and as the time was short, competent women were immediately appointed in such districts to see that their respective legislators were properly interviewed, and to be ready to have letters and telegrams sent to Springfield when called for. Trout and her allies focused on the 1913 legislative session, settling on a bill sponsored by Sen. Hugh Magill, a Princeton Republican with roots in Sangamon County, to allow women to vote in presidential elections and to fill some local offices, though still not in elections for state government posts. The House posed a stiffer challenge, right up to the day of the vote on June 11, 1913, Trout wrote. Shortly after the session opened the before mentioned doorkeeper came and very brusquely ordered me to go to the gallery. Around the rotunda rail lounged a number of our opponents, so I said I preferred to remain where I was. He scowled his disapproval, and presently returned and said that one of the House members who was an active opponent of our measure, said if I did not go to the gallery at once he would introduce and pass a resolution forcing me to do so. I answered politely saying that of course the member was privileged to introduce any resolution he desired, but in the meantime I would remain where I was. The men around the rotunda rail were watching the whole procedure and when I still remained in spite of this warning they regarded me with unfriendly eyes. There was a lawyer among them who longed to get inside that day, but he did not like, even with the backing of a friendly doorkeeper, to violate the law — that forbade any lobbyist to enter the House after the session had convened — in my presence. Shortly afterwards there was a deafening roar and several men rushed out and exclaimed “We have won. The bill has passed.” I remember turning my face to the wall and shedding a few quiet tears and when I looked around there were about ten men who were all surreptitiously wiping their eyes. The Presidential and Municipal Suffrage Bill passed the House by the following vote: Yeas 83 (6 more than the required majority) to nays 58. After the drama of the suffrage law, Illinois’ ratification of the 19th Amendment six years later was anticlimactic. The vote totals on June 10, 1919, were 46-0 in the Senate and 135-3 in the House. Acknowledged leaders in the women’s voting movement in Sangamon County included: Maude Gregg Palmer, who headed the 21st district of the suffrage association and was president of the Springfield Woman’s Club; Mary Mather, whose personal checks included the stamp, “Votes for Women”; and Harriet Reed, president of the Springfield Suffrage Association. Mrs. George E. Lee was Maydie Spaulding Lee, a major force in Springfield’s progressive movement in the first two decades of the 20th century. And Mrs. Susan Lawrence Gehrmann is better known as Susan Lawrence Dana, who had Frank Lloyd Wright design the Dana-Thomas House. Note: Hugh Magill was elected to the Senate from Princeton, not Springfield, as this entry said originally. The entry has been corrected. This entry was posted in Illinois capital, Local government, Politics, Prominent figures, Schools and school districts, State government, Women. Bookmark the permalink. Hello! Do we know if Susan Lawrence (Dana or Gehrmann) was ever officially a member of the Springfield Women’s Suffrage Club, and if so, how soon she began to participate? I know that she was very active in the early 20s organizing for equal rights legislation, but I haven’t found anything that ties her to this work in the teens when the Club was so active. Dr. Arthos: The name of the group appears to have been the Equal Suffrage Club, and, yes, Susan Lawrence Dana (as she was then) was not only a member but was elected president in 1910. She would have been 48 then, so obviously her suffrage activity was longstanding. I’m sending you a separate email with a PDF page from the April 16, 1910, Illinois State Register that reports her election. As to your other questions, you have two good options. 1) I gather you’ve already had some interaction with Roberta Volkmann and her blog, “Susan and Me.” Mrs. Volkmann is the real expert on Mrs. Dana. It looks like she’s not very active any more, at least on line, but it’s worth asking her those questions if you haven’t already. 2) Alternatively, you can search the Register and its competitor, the Illinois State Journal, for stories about Mrs. Dana’s suffrage work via one of two websites: NewsBank.com, which is free to use through many public libraries (you’ll have to check with yours); or GenealogyBank.com, NewsBank’s sister, which you can use for a small fee (I think about $8 for a month’s subscription). Both sites are fully searchable, though sometimes you have to be creative with your search terms. I was just wondering if you knew anything about Elizabeth Cady Stanton and if she ever did anything in Chicago or simply anything related to it. I know she did a lot of things in the mid 1800’s and she was focused more around Seneca Falls but I’m just wondering If you happen to know any connections. Ms. Jum: The Sangamon County Historical Society is based in Springfield, 200 miles from Chicago, so my knowledge of Ms. Stanton’s activities there is limited. Elizabeth Cady Stanton did appear once in Chicago, at a suffragist convention organized by Mary Livermore on Feb. 11, 1869. Both women then traveled down to Springfield for an appearance on Feb. 19, 1869. Legislators were specifically invited. The local papers don’t seem to have reported the substance of their speeches, but the Illinois State Journal did say they “presented their side of the matter in a manner, which if it did not convince, at least inspired a general respect for their comments.” I haven’t studied Ms. Stanton’s career otherwise, but I’d be surprised if the 1869 convention was the only time she visited Chicago. I suspect Chicago newspaper files (searchable through NewsBank.com and GenealogyBank.com) would help you a lot more. Thanks for reading. Looking for info on a Harriett Hoffman Beckwith, she was a member and past president of the Englewood Equal Suffrage Club.